Search Santa Fe, NM horse properties for sale below! Nothing has shaped The American West quite as much as the horse. And for over 400 years, throughout indigenous, Spanish Colonial, Mexican and Anglo culture, horses have been a vital part of the civic, agricultural and recreational experience in Northern New Mexico. Santa Fe and surrounding areas amaze riders with what's widely considered the most diverse and scenic riding terrain in The United States: high desert, pine and aspen covered national forests, active volcano calderas, expansive BLM land, rivers, lakes, and a multitude of multi-colored, picturesque arroyos. And the Santa Fe horse properties for sale only enhance these views and promote this lifestyle. Don't just take our word for it! Browse the listings below or find more information about Santa Fe horse properties for sale below. Don't forget to register with us to receive access to unlimited listings. View all properties on the MLS and be notified when a home that meets your search criteria becomes available! Today, that spirit and history of riding is still alive in the numerous and unique horse properties for sale that have established Santa Fe as a horse-lover's haven. From million plus, dynamic grand estates equipped with the latest riding facilities on massive tracts of acreage, to dreamy adobe homes that border the wonder of the national forest, Santa Fe Properties' associate brokers have unmatched expertise in finding equestrian properties that speak to the way their clients live and ride. Maybe that's because a number of our brokers have horses themselves and love to ride with family and friends. Whether you prefer a horse property with a move-in ready home already established, or would rather build your own dream residence, you have both options available in Santa Fe. From gorgeous luxury estates to modest ranchers, there's truly something for every type of buyer. Additionally, many of these residences are simply stunning. From gorgeous exposed post and beams to grand kiva fireplaces to gourmet kitchens, these properties offer everything you've been searching for and more. Riding culture is also very strong in Santa Fe. Enthusiasts flock to events at HIPICO to see world class horsemanship and riders. HIPICO Santa Fe is a major stop in the southwest horse show circuit, featuring competition arenas equipped with all weather footing to spacious stabling facilities, and miles of trail riding. 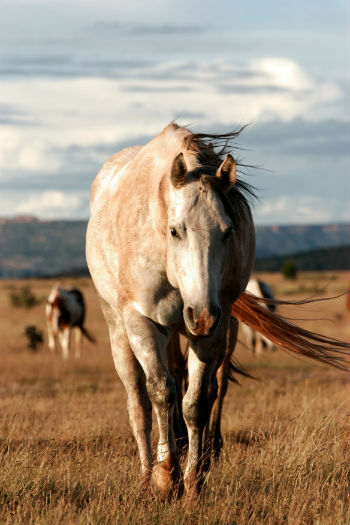 Contact Santa Fe Properties to learn more about the horse properties for sale. Or if you prefer, simply call us at (505) 982-4466.